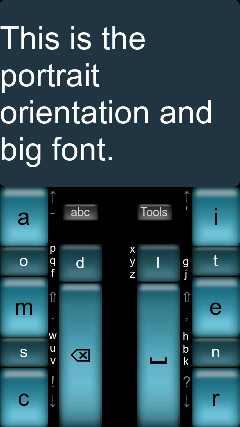 Type text fast on big keys in clear font. This innovative keyboard is intended for those not afraid of finding new ways of doing things. A bit to learn but rewarding! Most often just press single keys but, now and then, press two at the same time or, instead, swipe a bit. Use with one or two hands. See screenshots. 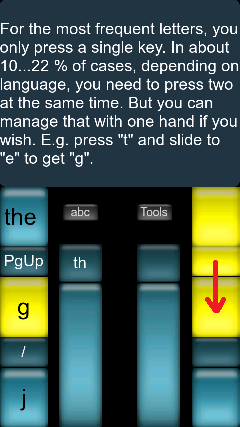 New version 0.3.1 introduces an optional ComboKey pad (in Settings) which is much easier to type on and reach by one hand. 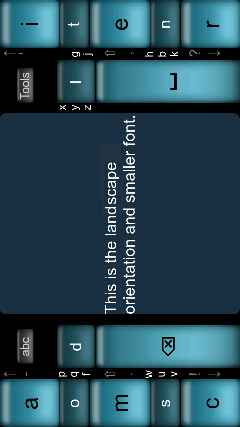 This stand-alone app supports several languages, themes and font sizes. You can copy the text to other applications or send it directly as an SMS. Latest received SMS can be viewed in big font. Check your skills to adapt! Night Clock during charging: double-tap Received SMS. Hint: Press Tools button long for Quick Menu in legacy GKOS layout. Hi, Alexxxlrus. English, Danish, Esperanto, Estonian, Finnish, French, German, Greek, Icelandic, Italian, Korean (draft), Malay, Norwegian, Portuguese, Russian, Sanskrit/Hindi, Spanish, Swedish and Ukrainian are supported with own layouts. You can select Main language and Aux language so you can switch between them with just one press of a button (abc). - BTW there is also a night clock (dimmer at night) which you can turn on during charging by double-tapping the Received SMS display. If you receive a message during the night, just double press the screen to see the message in big font with sleepy eyes.